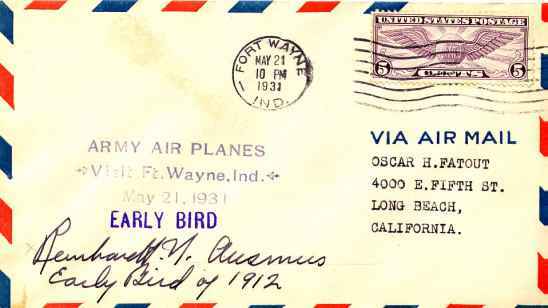 Editor's Note: This is a transcript of the many talks and addresses given by Reinhardt Ausmus of Sandusky, Ohio, narrating his record and history as a pioneer in early aviation. He designed his first aeroplane in 1910, It took two years to build and he flew it first in 1912. The transcript is found in a 23 page booklet, along with many news clippings with photographs, which Foster Lane had sent to my wife, Jo, when she was writing the book about her father, Walter E. Lees. I can find no record of the publisher. "We would like to try to cover the period of early aviation as known and experienced by myself (excuse my personal remarks) and try to cover the subject as rapidly as possible and not omit anything. It still shows that Sandusky had a very important part in the prime area of aviation. I might say that I was raised as an orphan and after I got out of the orphan's home, I had nothing else to do but look to the future, and it dawned upon me that I would like to build an aeroplane. A few of you older fellows will realize there were very few aeroplanes in 1910. I'd like to describe some of the hardships under which we had to build them. In those days, you had three classes: 1. The military; 2. The man from the family of wealth; 3. Fellows like myself. In building this first plane, started in 1910 - I designed it myself and it took me two years, until 1912, to complete it, due to finances. I wasn't able to get any financial assistance, had to design and build it myself. I built it on the third floor of a building by mantel light. I had to sacrifice a great deal. I worked during the day and allocated myself 10 cents a day for meals, and that included a tin bucket of coffee, and I added twice as much water to it as I had coffee, and to make it go further, I used to get a dozen and a half stale sugar rolls for a nickel, and the rest of my money I would spend buying materials to build the plane. I couldn't afford to go to the lumber yard to buy the materials. I used to carry a plank in from the country, about three and a half to four miles out, and pay for the plank as I could. I couldn't afford to have it machined, so I got a second hand saw, would cut it with that old crooked saw, then take it and sight down to it. When it came to finishing it, we didn't have the money to get it wood machined to shape and size, so we would get broken glass in a hardware store and scrape the wood hours at a time to shape it up. And all this was done by mantel light. Also, we didn't have all the bits we needed in those days, so we used to go to the blacksmith shop, get some round pieces of iron and that the blacksmith had cut off this and thaat and the other thing, and put it on the little hot plate, get it red hot, and then burned a hole in the wood - and I admit at times the holes were a little big. Also, we didn't have any plastic wood at that time, so we took sawdust, glue and mixed it together, and filled the hole if it was too large. In those days we used 3/16th stove bolts, believe it or not, where today, we have castellated bolts and nuts, etc. Also, I couldn't afford to buy rubberized silk they had at that time, so I got some muslin, had a woman make me up a batch of starch, coated the cloth with it and tried to seal it, and then I varnished the cloth." ONLINE RESOURCES If you search for "Reinhardt Ausmus", using the Google search engine, (2-21-04), you will find about 11 links. Among the most helpful are the following. into Ohio Veterans Hall of Fame Our friend Dorene Paul sent the following email message on 11-6-07. It is probably not a lot of new information, but it is exciting that he is going to be inducted into the Ohio Veterans Hall of Fame! This is exciting news. You can access this very informative article by clicking on the title above. In addition to the many anecdotes and several unique photographs.You will find a number of very important links on the page. I thank Dorene for alerting us to this valuable addition to his story. Introduction The Reinhardt N. Ausmus Collection is part of the Rutherford B. Hayes Presidential Center's Charles E. Frohman Collection. The Frohman Collection documents the history of the Erie Islands and the area along Lake Erie's western basin. Scope and Contents The Reinhardt N. Ausmus Collection documents the development of aviation in the United States in general and in the Sandusky, Ohio area in particular. The collection contains some 200 volumes and 5000 items, spanning the years from 1900 to 1970. Within the collection are some 600 photographic prints of pioneer aviators, early airplanes, airfields, and aviation companies. Numerous books, pamphlets, brochures, guides, directories, and programs focus on the pioneering aviation period. Additionally, extensive files appear for Ausmus, the Early Birds, Charles Lindbergh, pioneer aviators, and the history of aviation. Of particular importance is the material Ausmus collected on the Roberts Motor Company of Sandusky, Ohio, an early manufacturer of airplane engines. Company catalogs (1908-1917), business correspondence, photographs, and approximately sixteen hundred blueprints (oversize) form the bulk of the company's records preserved within the collection. Reinhardt Ausmus Photographs. This page on the ohiomemories.com website, offers access to three very interesting sections devoted to photographs and the speech which was previewed above. They were contributed by the Rutherford B. Hayes Presidential Center. You can access the page by clicking on the title above. You will find an entry for his solo flight on the AeroFiles website. You can find that entry by clicking on the title above. You may want to use the "Find" function on "Ausmus" to locate the story on the page. Santa in a Plane at the Reinhardt Ausmus Residence The unique Christmas decoration featuring Santa Claus as the pilot of an airplane once appeared on the roof of the home of Reinhardt Ausmus. To read the complete story, which is illustrated with two full size photographs, click on the title. Reinhardt N. Ausmus, known to all his friends as "Reiny" died in Memory Hospital, Sandusky, Ohio November 21, 1970 after a lingering illness. He was born July 7, 1896 in Cleveland, where he was raised in an orphanage. In 1912 he built and flew his first airplane. On August 17, 1970 his name was inscribed on the Roster of Fame in the Air Force Museum at Dayton, Ohio under Public law 88-372 by Act of Congress. For many years he was associated with Tom Benoist, who had a flying school at Battery Park. During World War I he served in the 198th Air Squadron as a flight instructor. Ausmus was appointed Service Officer by the Erie County Soldier's Relief Commission and was employed by them for 20 years, retiring in 1969. He was honored by the Sandusky Chamber of Commerce in 1968 with the Meritorius Service Award and was a recipient that same year of the Sandusky Register's Outstanding Community Service Award.